Ross Sanders also known as JunkyRock13 or just JunkyRock. 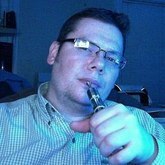 I have been a vapor since the beginning of 2012, and feel that it has been one of life changing event. In just under a year I have been introduced to many great people, and had a chance become friends with a lot of them. I am a married to a wonderful woman, Kimberly, and have 4 wonderful children (3 daughters, 1 son). I am a Network Support Tech and live in Upstate NY. In the past year, since I started vaping, I started doing vaping reviews on YouTube, and then started hosting a show on Saturday evenings on Elixir TV in August 2012 called Gratefully Deadicated Vaping. Find Junky Live on Saturdays at 8pm Est time. Great fun, learn about rebuildables and much more.